Is the containment of strays really necessary? Are they a menace to society? Does the community want to get rid of stray dogs? How does the government feel about them? And are the methods of getting rid of them ethically sane? Every creature is susceptible to diseases. The more hygienic you live the cleaner your body is and the less threats to your and others’ immune systems you carry. When residing in filth or generally on the streets people or animals will always be very close to where these viruses/bacteria live. Surviving on the streets can be a harsh lifestyle however it makes those living there stronger than those who live in a cozy house with a fire and clinical access. The reason for this is that the more stuff you are put through the more you can take next time as long as the recuperation and incubation periods are spread evenly between illnesses. Also regarding your immune system the more diseases you carry the more suffering you are put through, these illnesses require antibodies in order for the host organisms to survive and the more the host is going through the longer it takes for the antibodies to be produced to combat whatever the animal might have. So as the wise man Friedrich Nietzsche said: that which does not kill us makes us stronger, as long as you are given enough time to recover. The effect is though that the streets are made more unhygienic than they already are because of the amount of diseases drifting around. At a certain point these diseases might become transmittable to humans as well as they become airborne. Being put in a merciless environment might make the animals hostile however this is rarely the case as most of the instances that animals attack are due to provocation or being an unfamiliar face in a neighborhood, in these instances it is because people take care of animals in their living area and the animals then become protective however this is hardly even the case as most animals are accustomed to having people around them. Around 150,000 stray-dogs roam the streets of Istanbul and most of these know exactly how traffic lights work, so these are social animals according to Ahmet Senpolat, an Istanbul-based lawyer running HAYTAP animal rights federation. As dogs are scavengers they are fully capable of going long durations of time without food however every bit of kindness by the dominant species in the world helps their survival. They also clean up the streets bit by bit; dogs, cats or other beings eat food found on the street. The main garbage is simply removed by the cleaning services and so these dogs do not destroy the garbage bags placed on the street and thus do not make a complete mess of the environment they reside in. Though the dogs have plenty of other things on their mind that pestering the cat population they do keep them in check as well as these also swarm the streets. Both cats and dogs get adopted by restaurants, street vendors or people willing to care for them or give food whenever necessary or shelter. Malnutrition is a major risk that these animals must endure. Sometimes going days without finding some proper food, these dogs are put under extreme stress. Though this is a risk most wild animals have, whenever an animal finds some food in the city it generally consists of scraps. These scraps are hardly a worthy meal for animals of this size as for the sake of comparison well taken care of domestic dogs get both a lunch and dinner. Also whatever they may eat is mostly not a balanced diet, the food that people eat on the street as take away is primarily junk food and when dogs find this they are put under similar circumstance that junk food junkies put themselves in. This is not even healthy for people in the long run. Clinically dogs hardly get any support from the Turkish government and in fact the government intends to take them to the far reaches of the city where they would be subjugated without being able to roam or find a safe haven to reside in peacefully. Psychologically stray animals are put through a lot of agony, as they live on the street they are hardly regarded any different than beggars except for the fact that beggars still have human rights. It’s a very degrading life being a dog. As it is a life most dogs get born into; it will be the only standard they have. Being adopted by a family and then being kicked out to roam the streets seems slightly crueler as it gives the feeling of being unappreciated which is psychologically even more devastating and could traumatize the animals making them either hostile or shy. How does the government regard the stray dogs and does it help them/regulate them? Trying to control the population is a continuous struggle of the government. In 2012 the Turkish government issued a new draft to law no. 5199, which “authorizes the removal of all stray animals from the streets, limits the number of pets permitted in homes, and recommends the termination of “dangerous” breeds.” The original law was all about “TNR” (Trap, Neuter, Return” or “CNVR” (Capture, Neuter, Vaccinate, Return), this meant that the stray animals were to be returned to the streets to live their normal lives however at a certain point in time, namely 2012 this changed when the Turkish government decided that it was fine to get rid of the strays by putting them in natural parks outside of the cities. This draft resulted in massive protests in all of the major cities in Turkey and tens of thousands of signatures. These signatures were sent to the authorities to prevent this from happening. Finally this draft was prevented however the assembly is again working on an amendment to ban stray animals from living on the streets. The problem with the national parks the government desires to make is that these will most likely just be fenced off areas, probably in forests where the animals will be required to fend for themselves and it might eventually even lead to cannibalism. According to the Turkish Forestry and Water Works Ministry these Natural habitat parks will be “places where animals will be looked after, fed, and sheltered until animals are adopted” though animal rights activists call these places as animal concentration camps. Using the current CNVR method of capturing, neutering, vaccinating, returning results in the vets placing them in forests outside of the city. This is just like giving them the death sentence as the dogs are attacked and killed by wild animals there. How does the community see the animals and do they help them survive? Dogs in Turkey are seen as unclean however as this is largely based off of a misconception from the Koran. In fact according to the Islamic book AYAT (verse in the Koran) 6:38 ” All the beasts that roam the earth and all the birds that wing their flight are but communities like your own. We have left out nothing in the Book. They shall all be gathered before their Lord.” Though the correspondent for actiezwerfhonden states: “They are regarded as lower species and it seems to be a law of nature in Turkish society that one always mistreats the ones that are lower.” Turkey has a secular state so it seems uncertain why still a portion of the population cares for the animals and leaves small dishes with food on the street for the dogs. The dog shelters that the government provides are not exactly what they seem either, similar to the forests that the new draft describes the taking care of the animals has quite a few flaws. According to animal lover and animal rights activist Beliz Lila Özkazanç “the dogs at the shelters are only fed when the government has the finances to actually do it” (2015) or can be bothered to take care of the animals. According to the correspondent for the actiezwerfhonden: “The majority of the 30,000 dogs that are living in shelters are locked up in a municipal shelter; places with more than a 1,000 dogs, that hardly receive any (medical) care or food.” So as a stray it might be better to actually live on the street as opposed to getting taken care of by the government. Dogs are still generally bought at pet stores because they are generally still cute, young or purebreds. The stray-dogs therefore hardly have a chance and as strays are neutered when captured the pet store dogs are not. In Turkey people often buy puppies from pet stores and are abandoned when they become too tough to handle according to Senpolat, this especially occurs according to HAYPAT during Valentine’s day as pets are bought as gifts. This again is a source of new unsterilized strays.Many people still do not want to keep dogs as pets however semi adopting the strays seems a suitable way to look after an animal that does not need to enter the house. Also building shelters in the street for the animals saves them from getting wet or sick, this occasionally happens and is easier to do for cats as these come jump up to higher places allowing two or 3 story shelters to be more efficient. 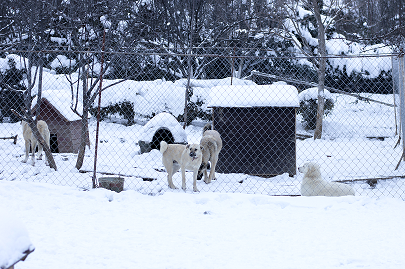 Another way to take care of dogs in Turkey is to send them to private shelters. Here you can pay for a shelter to take care of the dog. There are several of them in Turkey however you need to know how to get there, as they do not have websites. One in the outskirts of Ankara costs 200 TL per month per dog. This includes food, shelter, medication and the attention they need. This does not even mean you have to see the dog if you do not want to however the animals running around there and having fun are all very well taken care of and seem very healthy. The caretakers live next to the shelter as well so someone is available 24/7 if one of the animals gets injured. It currently also has a 200 dog limit but as they have the room to expand more volunteers and construction is required. As of yet the community seems to have a warmer heart than the government. Adopting a dog from one of these shelters is free and so the shelters don’t make any more money or have an easier job when an animal leaves their care. So there is hardly any reason why adopting an animal should not be done. This year the temperatures plummeted to -19 during the nights. That is fairly cold and just visiting the shelter sends shivers down your spine, it was that cold and in the middle of nowhere that it seemed even more desolate and barren. Though seeing the animals get all excited with the presence of visitors just warms you up again. This really makes you wonder how the more unfortunate dogs in the city must be trying to hold on to their lives as they’re much thinner and do not get taken care of. Some people carry dog or cat food in their cars so whenever a starving animal is spotted or one with malnutrition pulling over next to the road to feed them is a deed well done. When walking the streets animals look taken care of though there are plenty of very skinny dogs. You will not find a dead animal on the side of the street quickly. As a lesson from the past, in order for this to actually become a successful mission everyone needs to give a helping hand as this prominent piece of heritage of Istanbul and the rest of Turkey only really stands a chance as long as the people give their full support. “Volunteers working in the shelters can only look after so many dogs and certainly do not have the funds to feed and treat them properly,” mentions the correspondent for actiezwerfhonden. Since the Ottoman Empire the people have treated dogs very well. The belief was that if you treat animals well you would be rewarded in a later life, similar to karma however that is more short-term based. “Attacking the dogs went hand-in-hand with attacking religion and superstition: dogs were reportedly treated better in religious areas and local folklore had it that when dogs were treated badly, disaster would soon strike the city” according to history lecturer Chris Pearson from the university of Liverpool. The first time that measures were taken to constrain stray dogs in Turkey was when Sultan Mahmud II was demanded to put them down by the British crown. To put this into context just before this all happened the Ottoman Empire was under attack by the sultan’s own janissaries as they mutinied against the ruling power out of fear of disbandment for they had become corrupt. The Ottoman’s new army managed to defeat the army of 6000 janissaries removing the threat. Now, the reason behind the British crown wanting to slaughter the dogs was that a stray scared a British tourist; the tourist plummeted to his death off of a high wall after having assailed the dog with a stick during his midnight walk. His Majesty’s government therefore gave Mahmud II the ultimatum. The Sultan refused to because it was unethical and cruel. The dogs were innocent beings and so not all of them had to be taken down as opposed to the janissary force who were a real threat, so he decided to banish them to the island Sivriada (also known as Hayırsızada or Okseia) off the coast of Istanbul in the Marmara sea, however the dogs swam back to shore. Expulsion of the dogs again happened during Sultan Abdülaziz rule (1861-1876) when he sent them to the barren, rocky island of Sivriada again. This time the dogs were retrieved as their cries ignited Istanbul’s population to desire to help the animals and they literally set up a giant fire in terms of protest. Though the origins exactly are unknown as where this large population comes from it has always been a part of Istanbul and Turkey for that matter, to remove it would take away part of Istanbul’s heritage. After continuous attempts to cull the dogs another large scale attempt to decrease the numbers was made. In 1911 tens of thousands of dogs were sent off to the island of Sivriada by Sultan Mehmed V. The animals could be heard crying off shore. 80,000 dogs died there due to starvation, drowning or generally the horrible conditions that they were put in. When an earthquake hit Istanbul it was seen as a sign of God’s punishment for abandoning the dogs and so the survivors were taken back to the main land leaving around 30,000 dogs alive on the streets. During the period before the earthquake 50,000 dogs died and one French opportunist living there used the remains of the animals and sent them to Marseilles in the form of fertilizer, bone powder and leather. This opportunist led to a French firm offering nearly half a million francs to make gloves out of the dogs’ hides. Even though the city was in a financial crisis the sultan nobly refused. His reasoning was that it was a cruel act and the human population had grown fond of the animals ever since the general consensus was that God favored the animals. Anonymous (2007). Animal rights in the Ottoman Empire. Anonymous (2011). I can’t think of an Istanbul that has no dogs on the street. Anonymous (2012). Valentine’s day precocessing in sin, sin of being partners! Güneş, E (2012). Animal law protested. Istanbul 2010 European capital of culture (2008). Sivriada. Occupy for Animals (N.A.). Turkey’s homeless animals are in danger! Pearson, C (2012). Stray dogs in Istanbul. Twain, M (1869). The innocents abroad. Unknown (N.A.). The dogs of Istanbul. Watson, I and Tuysuz, G (2012).